Restaurants are establishments where romantic dinners are catered as well as corporate meetings and common celebrations. And although there are tons of restaurants in a single city, the possibility that the place will be full during a certain hour of the day is huge. This is the reason why restaurant reservation forms are prepared by the restaurant staff and are presented to their clients to assure that every client will not be left standing and disappointed. This type of document can be used in varying formats such as in doc and in PDF formats which will allow restaurant businesses to cater their online and walk-in clients. The restaurant reservation template design to be used must be included in the restaurant business plan to assure that his business partners and investors are informed as well as acquire a feedback since every restaurant form must be agreed by every involved party. The template should be created with the consideration of the restaurant’s color scheme, logo, and theme for promoting harmony in the business. Catering to events and occasions are some of the expertise of restaurants, which is why a restaurant reservation confirmation form must be completed by clients who want to have the catering services of the restaurant. Depending on the restaurant management’s preferences, the form can be accompanied by other essential documents such as a delivery confirmation form and a service confirmation form. The delivery confirmation is allotted to the staff of the restaurant to determine if the products and other items for the restaurant have been delivered or not. The latter is for distinguishing what services are rendered to the client or to an organization who requested the restaurant’s catering services. Before clients will sign any restaurant reservation form, it is significant that the client will be presented with a restaurant menu and a restaurant proposal. The menu form will inform the client about the varieties of food, drinks, and all other offers of the restaurant along with their associated prices. On the other hand, the proposal form will indicate why the restaurant must be chosen by the client to coordinate their event and celebration compared to the competing restaurants. Managing a general restaurant business does not only require the owner and his employees to be good at creating dishes but also they must be excellent at assuring that their tables can cater everyone who wants to dine in. 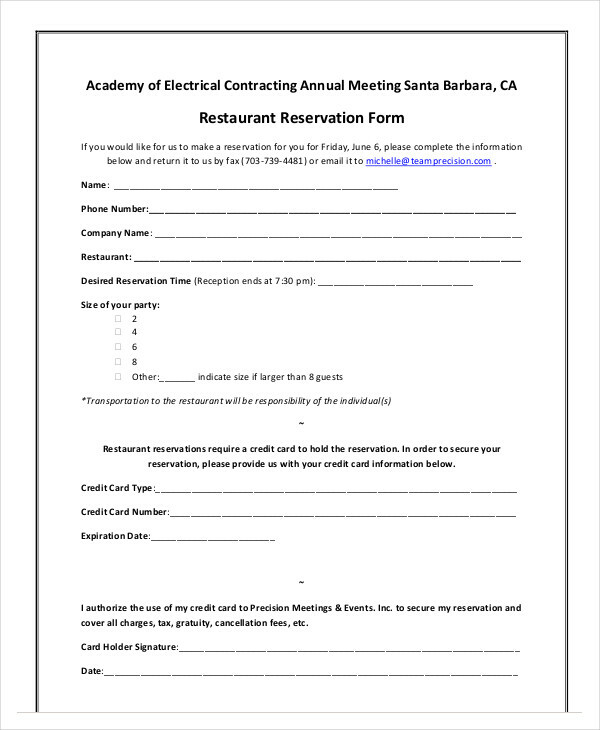 Specifically, a restaurant reservation confirmation form is an effective tool for the restaurant staff to assign tables and seats for their clients. With the form, the restaurant can inform their clients if they are already fully booked and if they still have available areas and amenities for their clients to dine with them. You may also see restaurant menu forms. Some restaurants operate in partnership with hotels and residential establishments wherein discounts and exclusive offers are given as a privilege to whoever rents in a room. With this, restaurant accommodation forms are provided to the hotel guests for them to complete their guest information and allow the restaurant to gather their orders as well as determine the discount amount that they will be receiving. The form also contains the check in and out of the guest which aids the restaurant to be informed if a client is still entitled to the discounts or not. You may also like restaurant operation forms. As a sort of security and assurance that a client will be paying the price for reserving a table, the restaurant staff will provide a restaurant reservation deposit form that must be signed by the client before his table will be prepared for him. The form contains the type of event that the client is reserving for, the client’s deposit amount, his payment confirmation, and information along with the terms and conditions of the restaurant regarding reservation deposits. Parties are occasions that are celebrated during holiday seasons as well as reunions and birthdays. 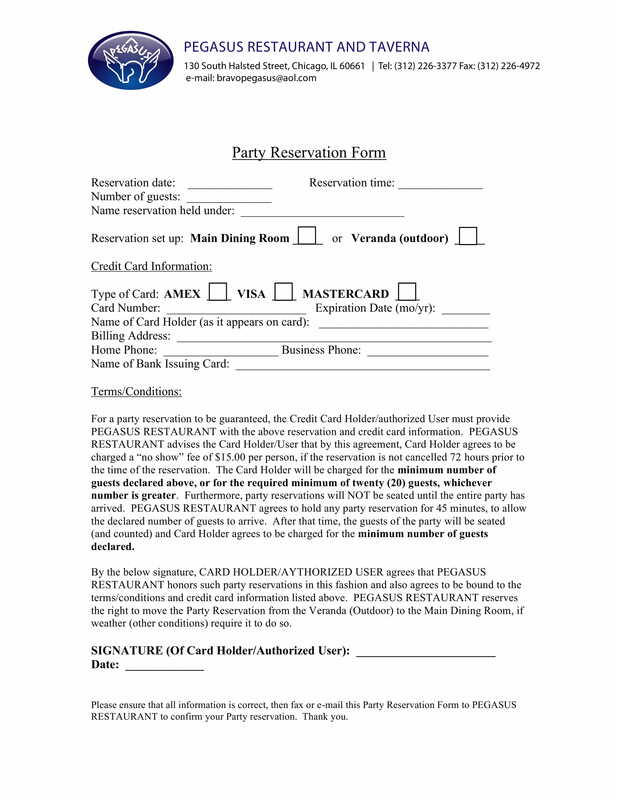 To formally reserve the restaurant establishment for a party, a client must complete a restaurant party reservation form. The form highlights the preferred date of when the client will be celebrating in the establishment, the number of guests attending the party, the credit card information of the client, and a reservation agreement finalized by the restaurant management. 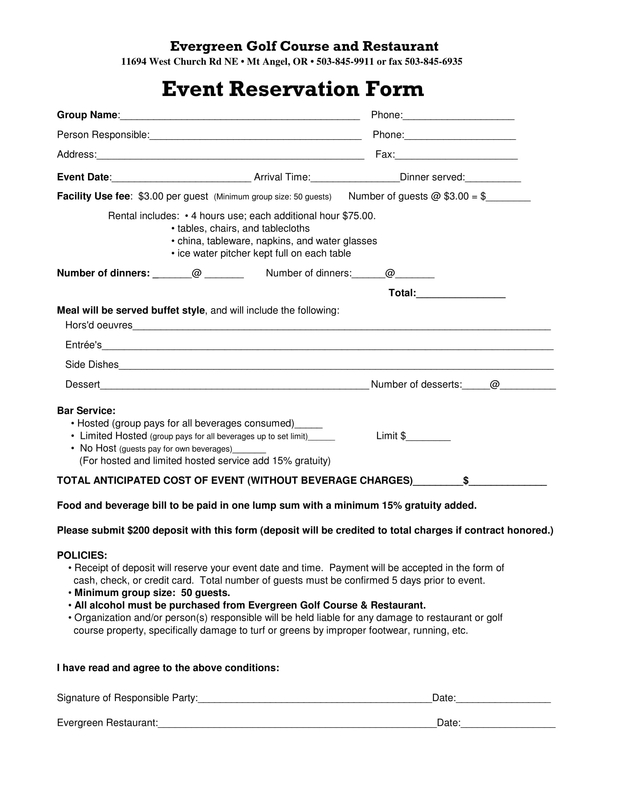 Compared to the aforementioned restaurant party reservation form, this document is not only applicable for parties but as well as formal events such as seminars, business meetings, and even education training opportunities. A restaurant event reservation form must have the name of the company who will host the event, an identification of the company’s representative who will be the person-in-charge in the event, and the company’s contact information. Other than the information of the clients, the form also contains the fees for the event, number of dinners, types of meals to be served, the services requested, and the restaurant policies. Once the details and the preferences of the client have been gathered by the restaurant management, a restaurant checklist must be customized which will be reviewed by both the client and the management. The checklist will allow the restaurant to cater every need and necessity of the client as well as assure that nothing is left undone for the event’s success. You may also see restaurant legal forms. Restaurant reservation forms in PDF formats are easier and more secure to be used by any restaurant management especially if this is incorporated into their website. One benefit that the management will obtain from using the form is that it allows them to lock the field items that are allotted only to be used by authorized individuals. With this, the clients will only be able to input their information and choices on the form, not change what is required and stated in the document itself. You may also see sample hotel reservation forms. Another benefit is that it is printer-friendly since PDF formatted documents are printed without worrying that the fields on the form will be interchanged and its arrangements are destroyed. Nonetheless, the choice of the management regarding what format they will use for their reservation forms highly depend on where and how they will present the document to their varying clients. 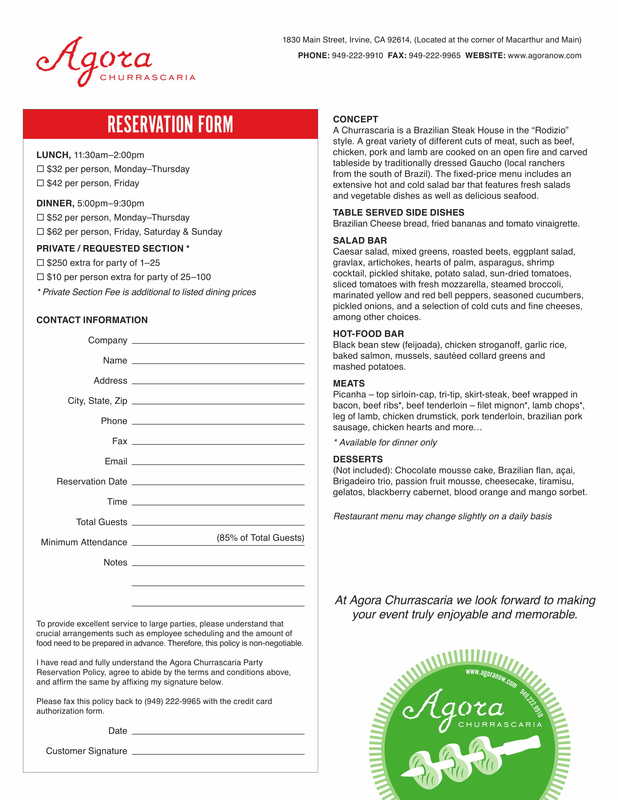 You may also like sample party reservation forms. 1. Indicate the name and the logo of your restaurant business. 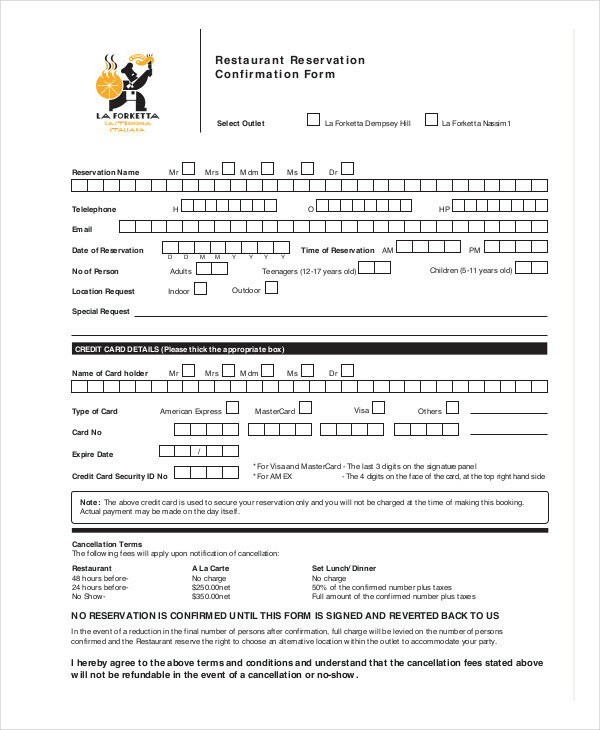 These will be placed at the top of the form along with the title of the document which is “Restaurant Reservation Form.” You may also see booking confirmation forms. 2. Place a section for the client’s general information. This section must cater the client’s full legal name, an indication of whether the client is reserving as a company representative or not, the address of the client, and his contact details. 3. Incorporate a section of the reservation details. This includes the date of when the client will be dining in the restaurant, the number of tables that the client will be reserved, the time when the meals will be served, and the name of the event. 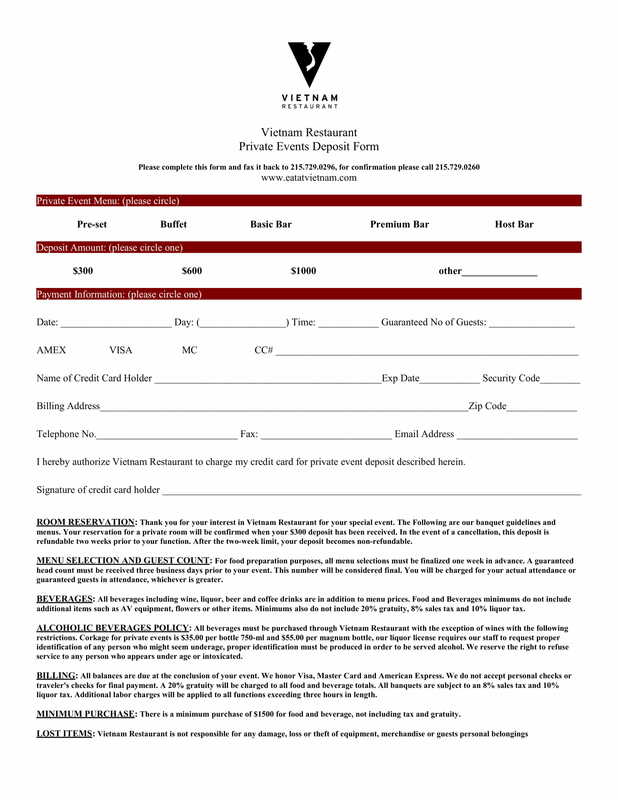 You may also like restaurant contract forms. 4. Add the menu options for the client to choose. Although there are restaurants who enclose their menu forms, it is always an advantage if the basic menu will be stated to allow the client be informed about what the restaurant can provide for him. In this section, the menu options must be accompanied with checklist boxes and their prices for the client to indicate his choice of dish and drinks. You may also see restaurant tax forms. 5. Indicate a table for computing the cost. This section will focus on determining how much the client will be paying for his choice of dishes, additional tables, and types of services. 6. State the reservation policies of the restaurant. With the terms and conditions, the client will be able to know the minimum number of heads required by the restaurant and the agreement regarding the use of the restaurant’s facilities and services. A signature area must then be indicated at the end of the policy statement along with a space for the date of when the reservation was submitted by the client. 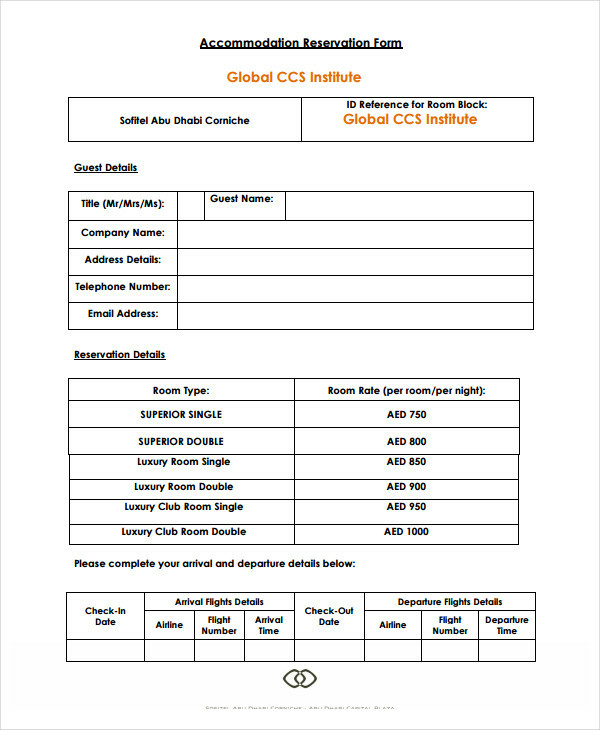 You may also like hotel receipt forms in PDF. When making restaurant reservation forms, the management must only focus on the significant information of the client and not on details that are not beneficial for completing the reservation procedure. Another tip to remember is to indicate credit card authorization statements if the management will allow clients who will pay through credit cards and bank transfer. Lastly, if the form is in a portable document file format, the management must connect the input fields to their database for an easier transaction and collection of data. You may also see catering contract form samples. Aside from restaurant reservation forms, restaurant business owners must prepare other documents such as agreement forms and restaurant evaluation forms. These documents will allow the management to transact a smooth business with their clients as well as acknowledge issues and glitches that need to be resolved. Nevertheless, with the right documents and sufficient information, any event and reservation should be made to satisfy the clients in order for the restaurant management to obtain positive restaurant performance ratings.